If you are looking for a bedroom design that looks cool and calm without overdoing the furniture than this design idea would definitely be a great choice. On a number of occasions, we feel we are stuck with heavy beds and linen and don’t quite find the time to reimagine the bedroom. However, this delay causes a lot of stress. An urban lifestyle is definitely not very pleasant towards those old and antique style beds. Therefore, you have to find something that is light and has a great appeal as well. In order to do this, you must first start focusing on the bedroom design idea that would suit your tastes well. Once this is done, you can buy the necessary furniture and get ready for a brand new bedroom for yourself. The bedroom design idea that we would be discussing below is more about calmness in the interior and would definitely suit a master bedroom well. To begin with, paint the walls of the room in a light but rich moss green. Make sure that there are accents in the room as it disrupts the harmony of the colors and gives a different look altogether. Make sure that the lights in your room are not white but bright amber so that you can relax in your room more often. Now, go for a green lining that runs across the room. This green line should be a bright forest green that is at the height of a typical chair rail. Let it be bright and solid and let it run across the room for a brighter effect. It would help break the monotony of moss green and would make every elements in your room look synchronized. This is quite helpful in making sure that the room remains looking elegant all the while. Opt for window blinds as they look quite nice. For the furniture parts, take a bed that is modern with visible edges. It should be a dark chocolate brown that enriches the color of the room. Go for a plain and simple headboard and don’t try to opt for heavily ‘designer’ beds and furniture. Add very simple glass table top end tables and decorate them with lamps or flower vases. Add a chaise to the room that is placed about 4 to 6 feet away from the foot of the bed. You can add a crushed velvet fabric chaise as well as it makes the room look quite nice. For linen and furnishing, go for solid natural fabrics like cotton. This should be quite helpful. Make sure that the bed linen is not plain, nor does it come with bold designs. Linen with symmetrical and small patterned designs in earthen colors would suit the settings quite well. Finally, you can add a picture or a scenery or a painting over the headboard to provide a little more personality to the room. 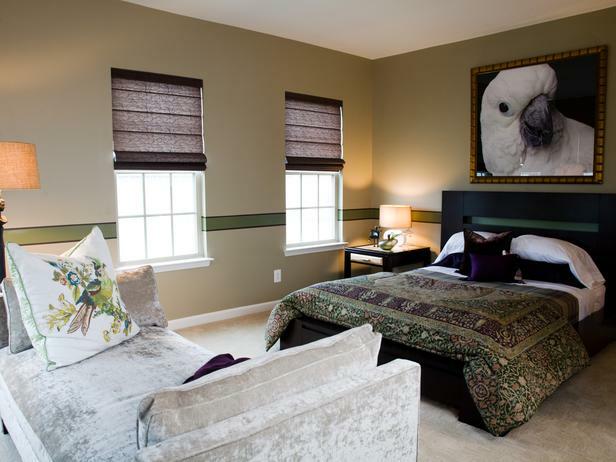 We have added a cockatoo picture that accentuates the natural outlook of the room and makes it look more relaxing than ever.